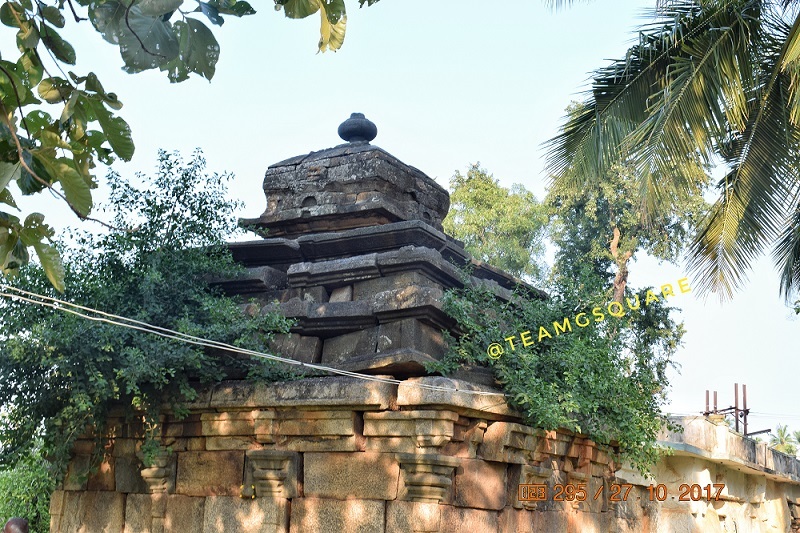 Having read about a beautiful Kalleshwara temple built by the Cholas in the district of Davanagere, it was always in the back of our minds to visit this interesting temple. There are quite a few temples in this region and Northern Karnataka built by the Cholas in the post Badami Chalukyan era. Earlier this year, we got a chance to visit Sri Basaveshwara temple at Hallur of Bagalkot district, also built by the Cholas around 8th century. Thus, it was quite intriguing to explore more Chola temples in the heartland of Karnataka, which otherwise is dominated by the Art and Architecture of the Hoysalas and Chalukyas.Bethuru is a small village lost in oblivion, and the was evident as many of my local friends were totally ignorant and uninformed of its location and whereabouts. Though this village popped up on the google map, we were surprised that the locals were unaware of its existence owing to its close proximity to Davanagere. We reached the village of Bethuru which is located at a distance of about 4 km without much difficulty and found the temple quite easily. However, we were displeased to witness such a beautiful temple in a sheer state of neglect, without any care or maintenance. While we were moving around, a person came by and introduced himself as the caretaker of Sri Kalleshwara temple, though an unofficial one. He visits the temple daily to do the necessary cleaning of the temple and decks up the god here with the flowers he collects. Though there are no daily pujas/rituals being performed here, he tries his best to keep the temple alive by lighting deepas (lamps) everyday. He shares his personal experience about how doctors gave up hope on his survival due to his chronic diabetic condition and that he would survive only for a few days. But ever since he started visiting this temple daily, he has only felt better, without facing any major health issues. He went on to explain that nobody in the village is interested in the upbringing of the temple and its maintenance, and whatever little money was raised to restore the temple was taken off by a few greedy people who ran away from the village and never returned. 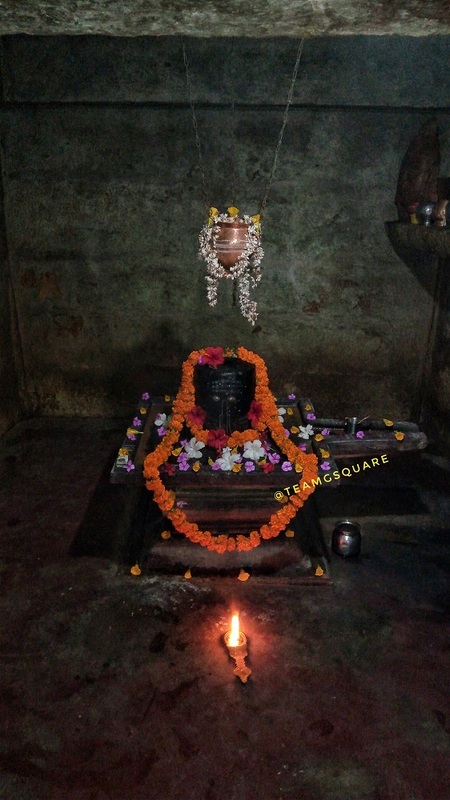 A lot of snakes happen to visit this temple regularly and embrace the Shiva Linga here, with one such incident having occurred recently during the Dasara festival. 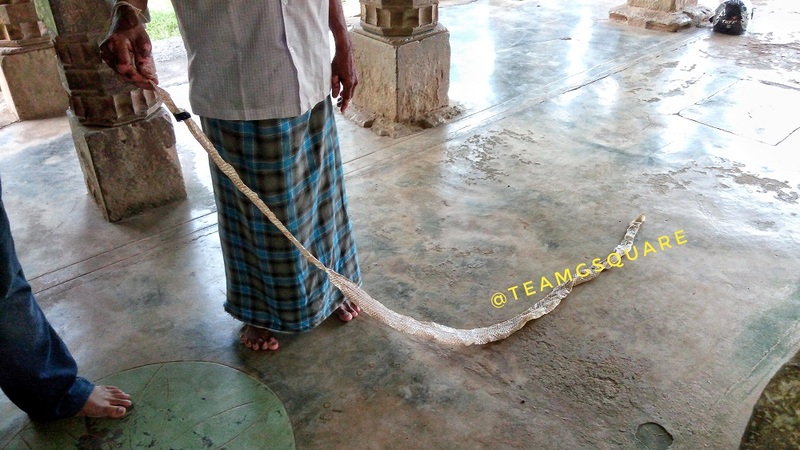 He showed us the remains of the shed skin of a snake inside the temple as a proof. He has carefully preserved it and shows it off to visitors with pride. 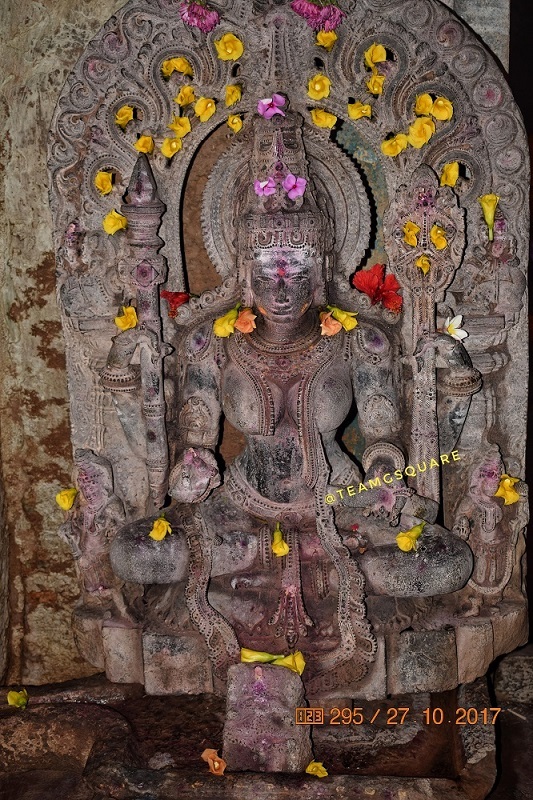 This temple was built by the Cholas between the 8th and 9th centuries, post the weakening of the Badami Chalukyas and before the rise of Rashtrakutas. 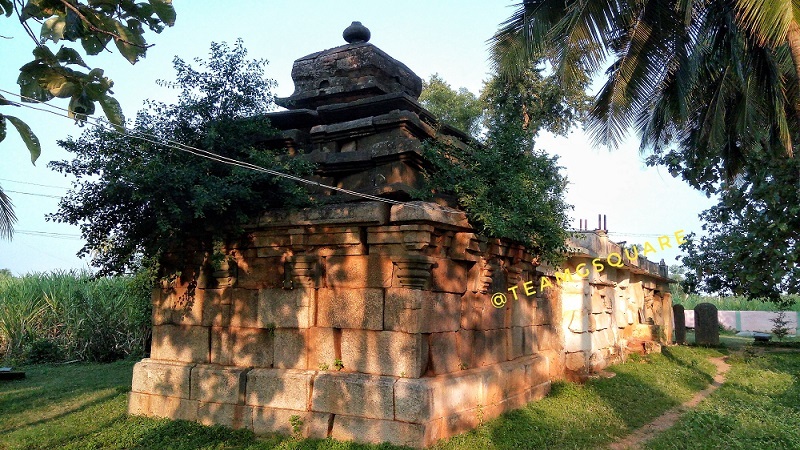 Later in the 11th century, this temple under went a few additions under the Kalyana Chalukyas. 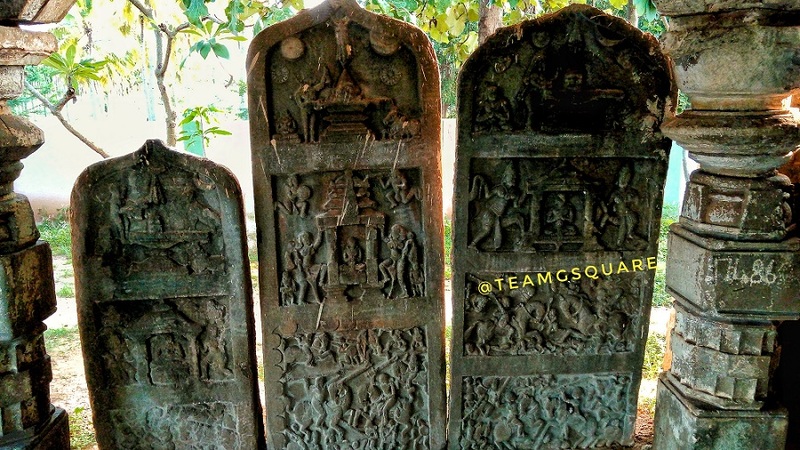 Many hero-stones found here which are now kept near the temple belong to the Kalyana Chalukyas. 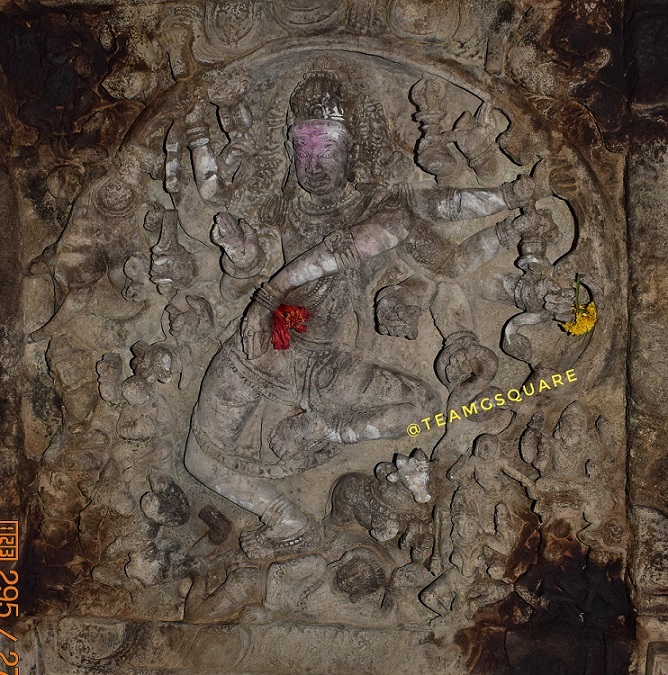 The most pleasing sight here is that of a beautiful carving on the ceiling panel of 'Gajasura Samara/ Gajasurasamhara' (depiction of Lord Shiva slaying the elephant demon Gajasura) in the central portion, surrounded by the Ashtadikapalas. 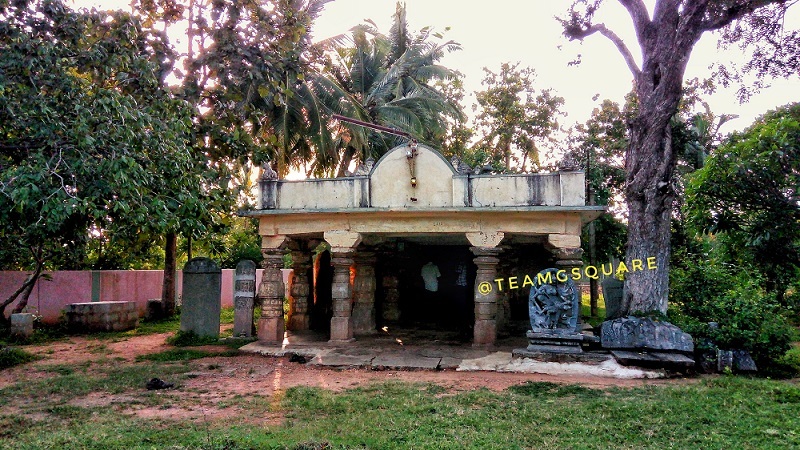 The temple is dedicated to Lord Shiva in the form of a Linga, with murtis of goddesses Saraswathi and Sapthamatrikas and Lord Subramanya kept in the Navaranga of the temple. 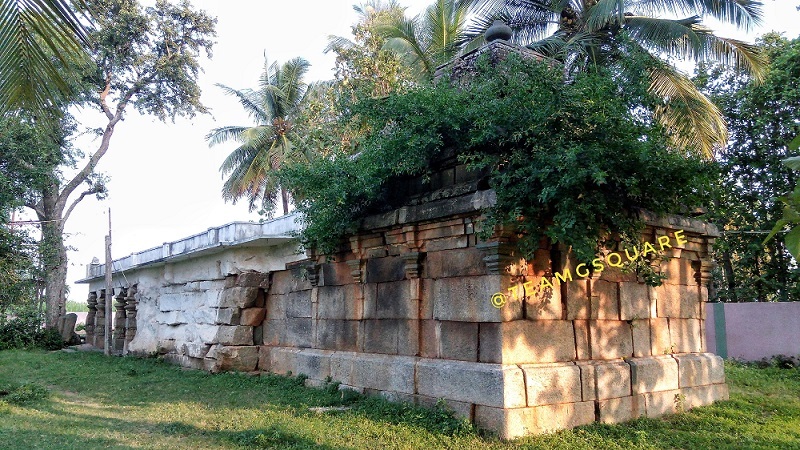 The Shikara of the temple is a perfect example of early Cholan architecture. 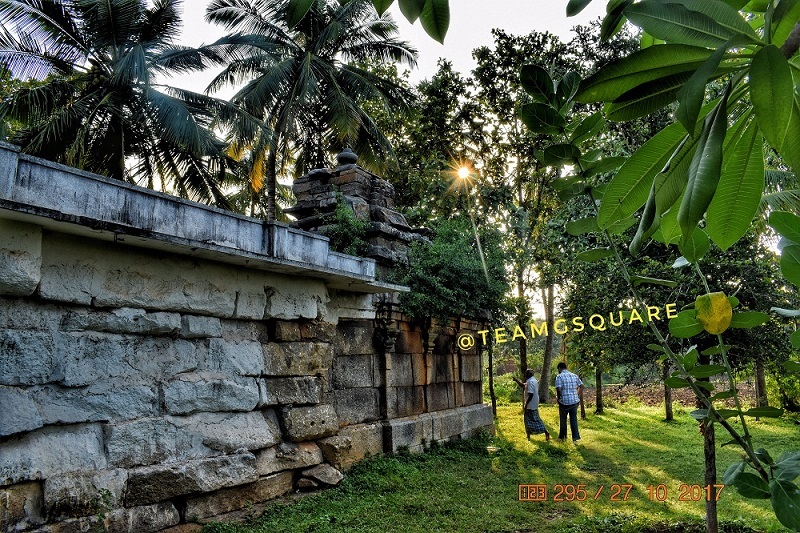 This temple definitely needs and deserves more care and maintenance in order to be preserved for future generations. How to reach Bethuru: From Davanagere, take the road to Jagalur and travel for about 4 km to reach Bethuru. Accommodation: Owing to its close proximity to Davanagere, accommodation is not very difficult, with one having a wide range of options suiting all budgets. Our preferred place for stay here was Hotel Anand Residency, situated besides the KSRTC bus stand. Places to visit nearby: Anekonda, Harihara, Bagali, Unchangidurga, Unchangipura, Kanakuppa, Bankapura, Haveri, Ranebennur and many such. It's a shame such a beautiful temple has been allowed to fall into such a state of neglect, but I'm glad the volunteer caretaker is doing his best to keep it alive. The idols seem to be in good condition. Lovely temple. 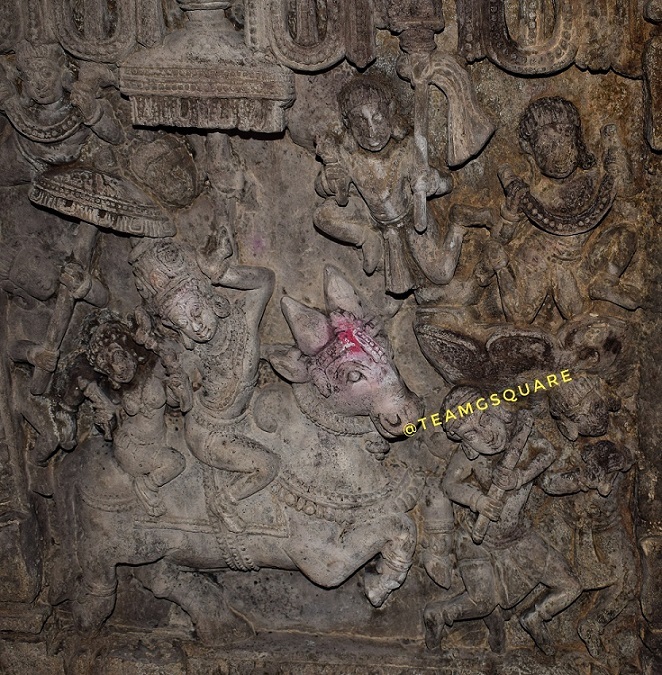 It doesn't look like Chola temple, the idols are of Holysala art. Probably built by Early Chalukyan and later improved by Hoysala. Few corrections on below text. 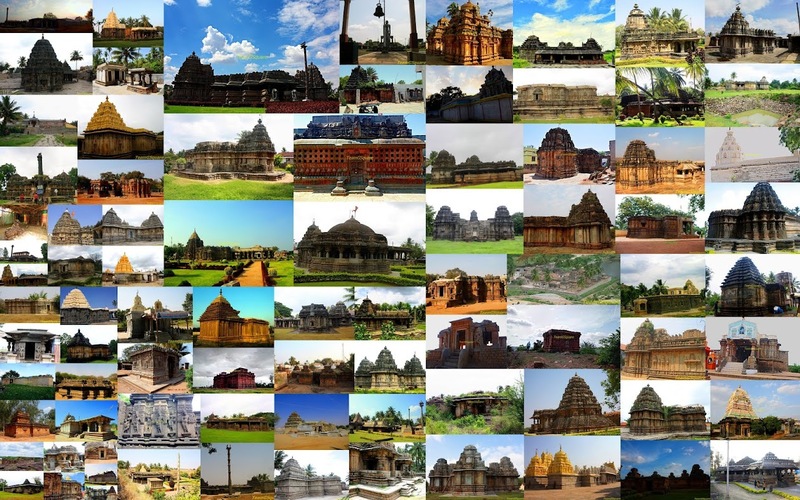 Chola's grew to prominence in 11th century after decline of Rashtrakootas, Badami Chalukya's declined early 8th Century to be replaced by Rashtrakootas till end of 10th Century. This temple was built by the Cholas between the 8th and 9th centuries, post the weakening of the Badami Chalukyas and before the rise of Rashtrakutas. 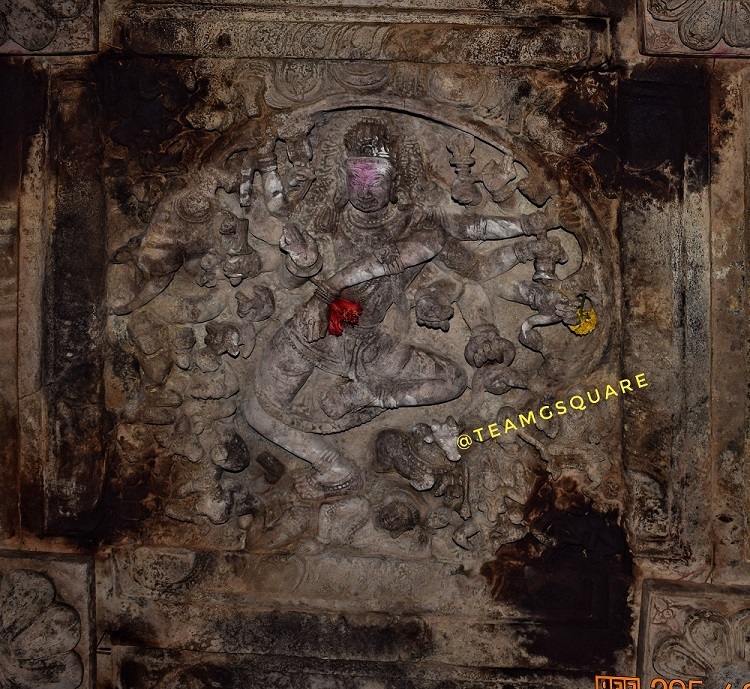 Later in the 11th century, this temple under went a few additions under the Kalyana Chalukyas.